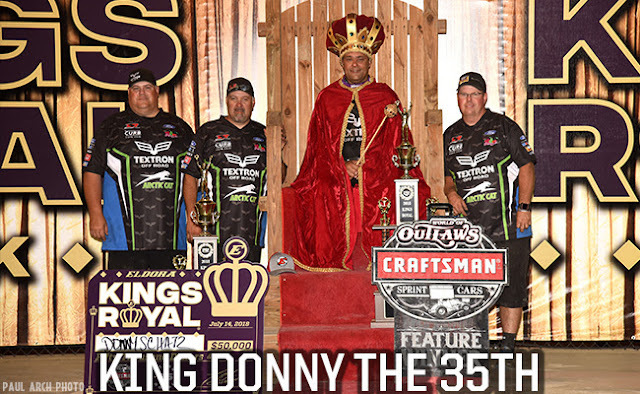 ROSSBURG, OH – July 14, 2018 – Donny Schatz started fourth, took the lead on Lap 15 and never looked back, leading the rest of the way to win his 15th World of Outlaws Craftsman Sprint Car Series Feature of 2018 and third consecutive Kings Royal at Eldora Speedway, worth $50,000. Brad Sweet surged late and came within a half of a car-length at the checkered flag, finishing behind Schatz by just 0.189 seconds. Cory Eliason, in his first career Kings Royal start, completed the podium. With the unique Kings Royal format, the six Heat Race winners occupied the first three rows for the 40-lap Feature. Trey Starks won Heat 6, earning the pole in his first Kings Royal start alongside Heat 5 winner, Paul McMahan. A caution on the initial start involving Hunter Schuerenburg, Sheldon Haudenschild and Brock Zearfoss brought out the only stoppage of the event. The complete restart saw Starks shoot to the lead, in search of his first career World of Outlaws Craftsman Sprint Car Series Feature victory in a big way. Schatz and McMahan battled for second with Schatz taking the position on Lap 3 and setting his sights on Starks. Schatz took a look underneath Starks on Lap 14 and completed the pass for the lead one lap later down the backstretch. Cory Eliason, who started sixth after winning Heat 1, established himself as a threat moving by Starks into second on Lap 16. Eliason actually slid Schatz for position, but was never able to maintain momentum and stay in front of the Tony Stewart Racing No.15. Brad Sweet maneuvered into third on Lap 17 and showed a lot of speed pounding the cushion. As Sweet closed in on Eliason for second, Donny Schatz extended his margin out front. Sweet would get by Eliason for second on Lap 27 and begin cutting into Schatz’ sizable advantage. As Schatz searched for grip the last 10 laps, Sweet really closed in. Sweet got hung up behind Daryn Pittman in lapped traffic and finally cleared him with five to go, setting up one last charge at Schatz. And charge he did. On the absolute cushion of the racing surface, Sweet closed in on Schatz, setting up a hectic finish. Sweet cut the gap to five car-lengths down the backstretch on the final lap and ended up just half a car-length short from his second career Kings Royal triumph. Schatz acknowledged that he was searching for speed the last 10 laps, “I knew someone had to be coming. I was hanging the last 10 laps, I could not get stuck anywhere. I’m lucky it wasn’t 41 laps tonight, because obviously, the No.49 was coming there at the end,” Schatz said in Victory Lane. “Lapped traffic was tough tonight, it was tricky and slick. I feel like I completely failed in Qualifying going 21st quick, but the way format works tonight it put us in the right position,” Schatz said before thanking all the fans, even the ones that boo him, for coming out and praising the track crew given the high temperatures all weekend. Brad Sweet was obviously disappointed but was pleased with the speed he showed. “I came up one lap short, some of those lapped cars didn’t cut me a break. Coming to the checkered, I was cussing because I wanted it to be the White Flag,” Sweet said with a smirk. “To be the best, you’ve got to beat the best and the way [Schatz] shows up at these big money events, is why he’ll down in history as one of, if not the best of all time. This NAPA racing team has nothing to be ashamed of tonight, I just wish it was one more lap tonight,” Sweet added before encouraging the huge crowd to come to the pits and introduce themselves. “After not making the first two shows of the weekend, to finish third behind Donny Schatz and Brad Sweet, feels like a win for this team,” Eliason added in good spirits after the race. Lee Jacobs represented the Buckeye State coming from 16th to finish fourth with Kraig Kinser coming from 13th to complete the top five. 12th-starting Jacob Allen finished sixth with Paul McMahan coming home seventh. 16th-starting David Gravel finished eighth with Rico Abreu coming from 24th to ninth, earning KSE Hard Charger Honors. Outlaw rookie Ian Madsen completed the top ten, coming from 23rd. Christopher Bell set Quick Time over the 51-car field and was running in the top five when he pulled pit side with 14 laps remaining. After the caution on the initial start, the race went non-stop. The World of Outlaws Craftsman Sprint Car Series continues its 40th Anniversary Season and Month of Money with the Don Martin Memorial Silver Cup at Lernerville Speedway, which will pay $25,000 to the winner. Following that the Outlaws will head to Central Pennsylvania to take on the Pennsylvania Posse at Lincoln and Williams Grove Speedway. If you can’t make it to the track, be sure to watch every lap LIVE on DIRTVision.com.